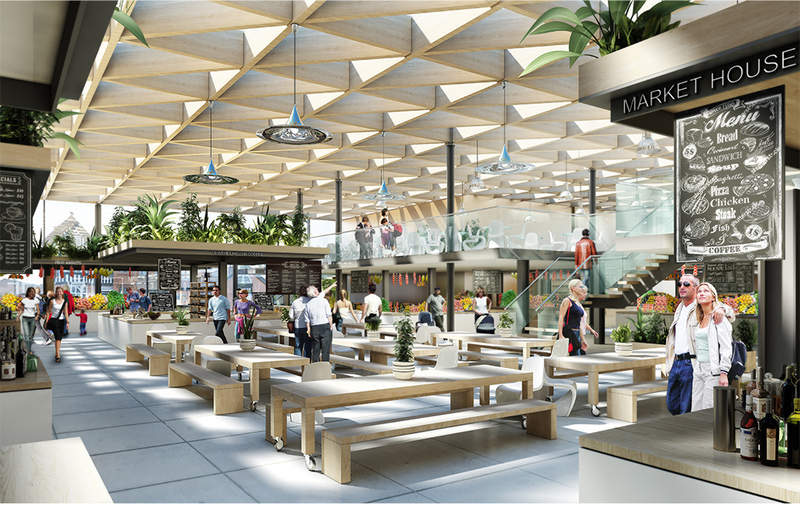 The interior of the market is conceived as a contemporary timber structure, echoing Chester’s wealth of traditional timber framed buildings and providing a natural warmth to the market interior. Wide roof spans and glazing allow a flexible, bright naturally lit interior. The carefully considered design of junction details and columns provides a finer, high quality scale to the design. A range of bespoke market stalls take centre stage, wrapped around a central dining space offering the opportunities for raised seating areas and planting opportunities to animate the interior. A mezzanine bridge level provides more flexible space for complimentary uses such as craft makers, exhibition, gallery and more flexible contemporary workspaces.